Apple won a pretty significant victory today in its attempts to block Samsung from selling its iPad competitor products in Germany and in greater Europe. This week’s IFA show is a CES-like pan-European event which showcases new consumer products from just about everyone except Apple. 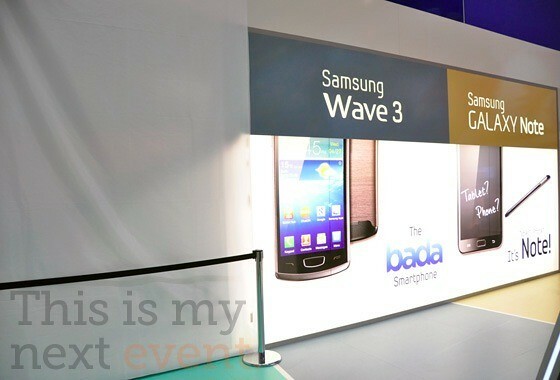 Most of the buzz this year however is around two of Samsung’s new products, the Galaxy Tab 7.7 and the Galaxy Note 5.3. Both have 1280×800 SuperAMOLED Displays and run Android 3.2 but the Tab falls under the line of products that Apple is trying to block and is currently under a set of injunctions in various parts of the world. Interestingly, Samsung was originally showing the 7.7 devices to reporters with “not for sale in Germany” stickers attached. However last night, Samsung started removing the devices from the floor and covering up the advertisements like the product never existed (below). It appears that Apple got Samsung to block the whole Tab line. The Tab 7.7 is much smaller than the iPad weighing only 334 grams, yet has a higher resolution screen – so it appears that Apple’s injunction is very broad. Samsung, Apple’s closest rival in tablet computers, pulled the just-unveiled Galaxy Tab 7.7 out of the IFA consumer- electronics show in Berlin after a Dusseldorf court on Sept. 2 granted Apple’s request to ban sales and marketing of the product, James Chung, a Seoul-based spokesman for Samsung, said by telephone today. “Samsung respects the court’s decision,” Chung said, adding that the company believes it “severely limits consumer choice in Germany.” Samsung will pursue all available options, including legal action, to defend its intellectual property rights, he said. It will be interesting to see what direction this goes. Will Apple be able to successfully block Samsung’s (and others’) tablets for sale across the world? There is some concern that if Apple doesn’t win in these cases, damages to Samsung could be significant.